In order to get the best performance out of your Monnit Wireless Sensors, it is important to note proper antenna orientation and sensor positioning. Antennas should all be oriented in the same direction, pointing vertically out of the sensor. If the sensor is mounted flat on it's back on a horizontal surface, you should bend the antenna as close to the sensor housing as possible giving you the most amount of antenna pointing vertical. You should make the antenna wire as straight as possible, avoiding any kinks and curving of the wire. For optimum signal strength determine the height at which the majority of your sensors will be mounted at and position the wireless gateway at the same height. 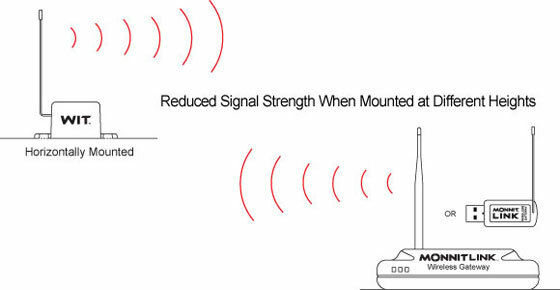 The sensor signal strength will reduce if the sensors are positioned higher than the wireless gateway. Also, the distance each sensor type needs to be from the gateway and other sensors depends on antenna type. Antennas should all be pointing vertically. Antennas should not be pointing vertically and horizontally. Sensors should not be mounted high with wireless gateways mounted low. Also, avoid positioning sensors or gateways on the floor. 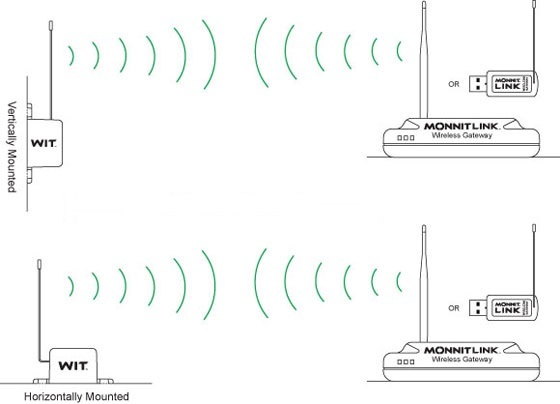 The strength of the signal between a sensor and a gateway can vary depending on the antenna equipped. Those sensors which can transmit long distances can sometimes have more difficulty up close. The nearer the sensor to the gateway depending on the strength of the signal, the more garbled the signal can be. The analogy we like to use is if you have a bullhorn and you are right next to someone, they will hear you but they may not be able to understand what you are saying because the signal is too loud. If you move away from the person, they will both be able to hear you and be able to understand what you are saying. The following are suggested distances the sensors should be from the gateway and each other. Coin Cell Sensors should always be placed a minimum of 3 to 5 feet from the gateway and other sensors. AA Sensors need 5 to 7 feet between them and the gateways for effective close transmission. Industrial sensors need to be at least 7 to 10 feet from the gateway and from each other. The Control Unit with its High Gain antenna should also be a minimum of 7 to 10 feet from the Gateway and any sensors or other control units. This distance is particularly important during set up when the sensors are trying to connect initially with the gateway as they are actively scanning to try to make contact with the gateway the moment the battery is inserted or the sensor turned on. So remember, when placing your wireless sensors, antenna orientation is critical to reliable performance of your wireless sensors. 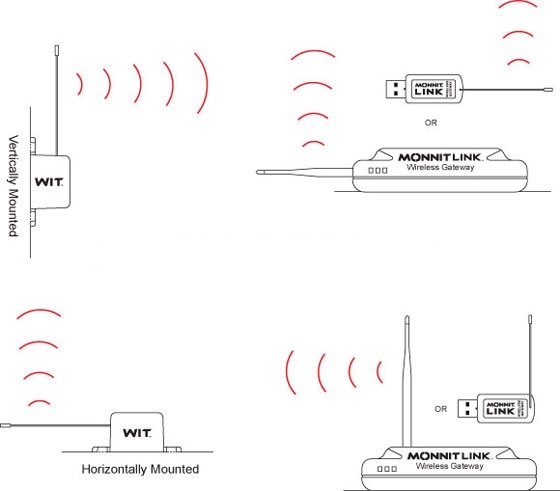 For more information and guides on using your wireless sensors visit www.monnit.com/support/.